An afternoon in the deep blue seabed! You must be a member of the Milan Language Exchange Group to attend this activity. Would you like to join this group? This aquarium is placed in a gorgeous liberty style building that with its friezes and majolica tells its content from outside. 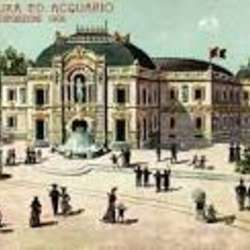 It's close to the Civic Arena, by the aisles of Parco Sempione, and it reproduces the same elliptical architecture. The aquarium has been restored in Protected content the current structure of the tanks and given back to visitors and to Milanese citizens. The Public Aquarium was built in Protected content , during the Milan International Expo, and it's the third ancient aquarium in Europe. On Sunday the 3rd February it will be possible to visit both the aquarium and the beautiful building free of charge. I thought we could meet in front of the aquarium by 2.30 pm and get in together. After the visit a chocolate would the best way to end up our afternoon! Don't miss this part of Milanese history!